Oh my goodness! I had the best of intentions of doing regular meal plans back in April 2011. After one attempt, it seems I ran out of steam. 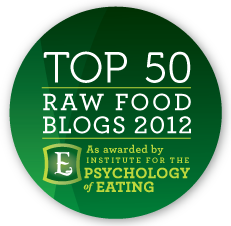 And here I go again in light of my 2012 raw resolutions…! The challenge last time was to try new recipes. This time I feel it’s necessary to revisit a few old favorites to get back into the swing of the high raw thing, and gradually add in new recipes. Would love your feedback on how useful this is to share with you all, or any suggestions you may have. Breakfast: I’m going to continue my regular morning routine… oil pulling when I wake up, warm lemon water after my shower, breakfast juice after I’m dressed. And I want to have a green smoothie every day so am going to try a new one from Kimberly Snyder. Lunch: salad… I’m planning on spending all day in the kitchen preparing food so don’t expect I’ll really need lunch! Yum, yum, and more yum!!! What a delicious week!! !